Can scientists name themselves in the scientific name when they discover a new taxon? There are sometimes people names in taxonomy, like Myotis keenii was names after Mr. Keen who contributed to discover the species. So, if you discover a species and someone else is constructing the scientific name and names you, it's clear. But when you discover a species and you publish it in a paper, can you propose a scientific name that contains your name? Has it ever happened, or is it considered an unhealthy practice? The answer is that in general, self-naming is severely frowned upon in the scientific community, but the act itself is not disallowed. There have been at least two instances of self-naming recorded in literature, as stated in John Wright's book The Naming of the Shrew, page 34, where Jules Bourguignat named a species of snail after himself as Ferussacia bourguignatiana. 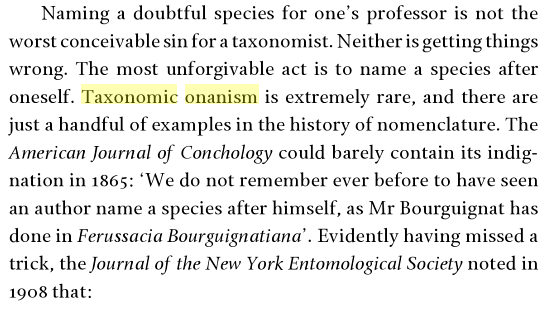 The naming was apparently very poorly received (being referred to as taxonomic onanism), although I was unable to confirm this by locating the original citation. 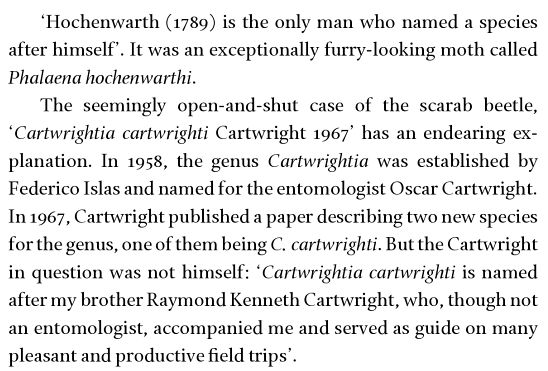 Another example was given in the book on Sigismund Hochenwarth who named a species of moth (now Syngrapha hochenwarthi) after himself (original citation here). Not the answer you're looking for? Browse other questions tagged taxonomy species or ask your own question. What is the scientific name of this plant? What is the scientific name of this evergreen plant? What is the scientific name of Japan's (other) national flower, the chrysanthemum? Where can I get a file/list of the common and scientific names of species?